Even before I was able to post Part Two (on 5/20), we heard of a new, but oddly familiar, news event that exemplified my thoughts. The White House announced that a Delta Force team had entered Syrian territory to kill an alleged ISIS “commander” and forty other villains in “hand to hand combat.” The “news” came as an uncorroborated statement: an evil mastermind threatened our safety, but our heroes (not regular Army and hence free, like all superheroes, to ignore international law and borders) had eliminated the danger, while actually saving a female captive! All corporate media carried the story. The NYT admitted that it could not verify it, but reported it anyway. 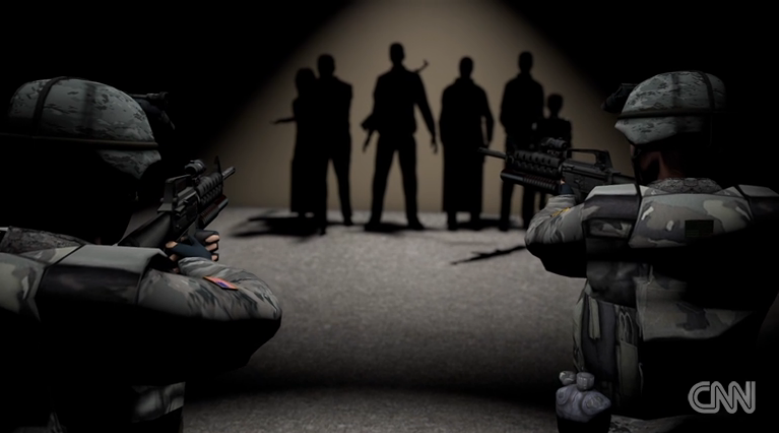 CNN even produced a CGI cartoon version of the raid, claiming that the ISIS soldiers (so evil!) had tried to use women and children as shields. A third factor that contributes to the re-vitalization of the myth of innocence is the mania produced by our technologically enhanced environment. In most large, indoor public spaces (stores, shopping malls and sports arenas) we have gotten used to enduring the unrelenting onslaught of loud music, blinking lights and high-definition visual images. This is most certainly not accidental. Take contemporary restaurant design for example: open kitchens, hard floors and high walls that reflect and increase sound, forcing patrons to shout just to be heard (thereby increasing the noise). 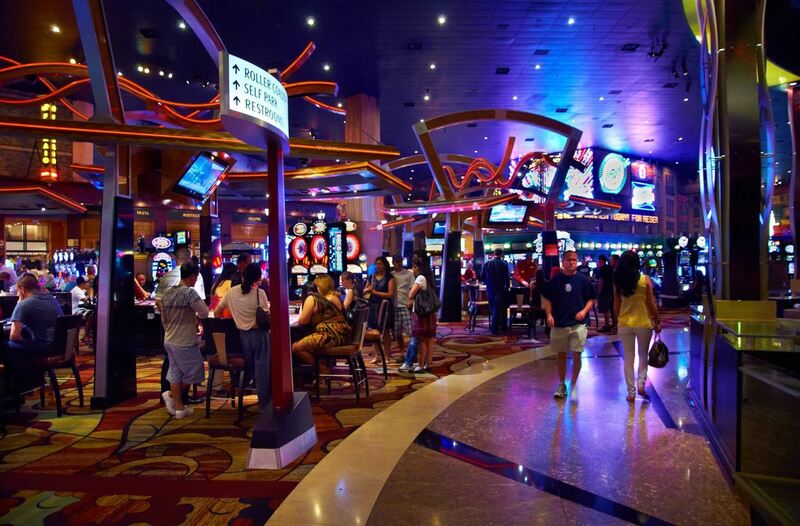 In many places, especially those catering to adolescents, the atmosphere approaches that of gambling casinos, which are deliberately designed to create altered states of consciousness. The object is to heighten anxiety and encourage the sense that it can be reduced through consumerism. However, because the anxiety never fully dissipates, we continually acclimate to greater levels of it. Could we find a better clinical definition of addiction? Or of madness? This awkward combination of fear, denial and stimulation has ruled our consciousness during the 65 years of television, which was born amid both the new consumerism and the political terrors of McCarthyism. Lucille Ball diverted us while Richard Nixon admitted, “People react to fear, not love.” My book argues, however, that the roots of this madness go back to the original confrontation of Puritans and Indians. Ever since, we have held the contradictory notions of chosen people and eternal vigilance. If we are attacked, the release of disillusioned energy drives us to violent extremes. Our lost innocence (We have done so much good! Why do they hate us so?) justifies our willingness to support reactionary policies and violent fantasies. The pathology of this condition is that the soul is subject to persistent messages that its emotional intelligence – its intuitive knowing of the sheer craziness of modern life – is completely discounted. It is exactly the same wounding that children receive when adults tell them that they don’t really feel something – and this happens every day of our lives. Few of us are able to resist the underlying lesson: My ways of evaluating reality are failures. But this is America, and we all carry the legacy of Puritanism. If my ways of evaluation are failures, then so am I. And – since failure in America is always moral failure, then I am also bad – I am a sinner. This has contributed to a massive epidemic of depression, substance abuse and further apathy and disengagement from politics – or the need to identify a scapegoat and punish him in the politics of white resentment. Although everyone (in the audience) was familiar with the stories, they did not sit dispassionately, isolated in the darkness, as we do; they crowded together in broad daylight. Confronted with irresolvable conflicts, they suffered like Dionysus himself, weeping openly in a purging (katharsis) of emotion. Aristotle explained that this came through “pity and fear,” but – and this is critical – W.B. Stanford translates eleos (“pity”) as “compassionate grief.” At the end of the day, they were exhausted but revitalized, not because their differences had been resolved, nor because a victim had been sacrificed for their sins, but because they had suffered together. Is it possible that we accept the daily experience of “shock and awe” because we no longer have the communal ritual forms that might permit us to experience compassionate grief along with our fear? I certainly think so. Imagine a culture that willingly and regularly grieves its communal moral transgressions and never builds up a reservoir of unresolved guilt. It’s much easier to imagine a culture that must continually deny that guilt through recourse to regular celebrations of innocence – and the sacrifice of scapegoats. As more and more flaws appear in the fabric of our dying mythic narratives – what these authors call “totem crisis” – and as the crazy-making conditions of our lives make it more and more obvious that the old story is dying but no new story has yet arisen to replace it, watch for the next sacrificial ritual. Watch how the media heightens the anxiety about the latest threat to justify another war (especially as Trump’s approval numbers plummet), even as it mixes the message with assurances that everything’s all right. Watch how much money you may be willing to pay to be ceaselessly told it is. Watch your need to remain innocent. The things I learned in your Olli class echo in my head every day, as I feel I am going mad with helplessness at the horror every day that I experience as I read the news and check the posts and try to let other people know what is going on. I am getting old and losing my fighting spirit to despair now. I cannot see anything but worse outcomes ahead. Just seeing the oiled pelicans at Refugio Beach, the children in Gaza and Syria and everywhere else, the destruction and “demodernization” of the Middle East, the endless apartheid in Israel/Palestine, the bullying challenges to we are directing at Russia, China, North Korea, as if we are eager to go to war again, against anyone. Teach another class, Barry, on how to keep one’s sanity amidst the madness of the world.